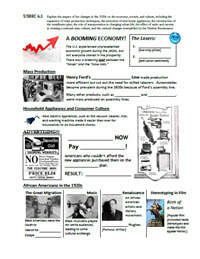 Standard 6 addresses the culture of the 1920s and the causes, course, and consequences of the Great Depression. The key topics addressed by this standard are the conflict between traditional American values and modernizing influences, consumer culture, the human suffering caused by the Depression, and the government's role in responding to the crisis. Explain the causes and effects of the social change and conflict between traditional and modern culture that took place during the 1920s, including the role of women, the “Red Scare”, the resurgence of the Ku Klux Klan, immigration quotas, Prohibition, and the Scopes trial.